The Deputy Commanding General for Maneuver for the Minnesota National Guard's 34th Red Bull Infantry Division and Task Force Spartan, Brig Gen. Mike Wickman, speaks with a reporter from Al Hurra about Task Force Spartan's mission as a part of Operation Spartan Shield. Task Force Spartan is a unique, multi-component organization, made up of active Army and National Guard units, rounded out by U.S. Army Reserve support units. Through Operation Spartan Shield (OSS), Task Force Spartan maintains a U.S. military posture in Southwest Asia sufficient to strengthen our defense relationships and build partner capacity. Units supporting OSS provide capabilities such as aviation, logistics, force protection and information management, and facilitate theater security cooperation activities such as key leader engagements, joint exercises, conferences, symposia and humanitarian assistance/disaster response planning. More than 650 Soldiers of the Minnesota National Guard's 34th Red Bull Infantry Division Headquarters are on a 10-month long deployment in Kuwait to provide leadership, command, control, and in-depth staff analysis for Operation Spartan Shield. The deployed Soldiers come from more than 220 communities throughout Minnesota, Iowa, Wisconsin, North and South Dakota, and several other states. They are expected to return home from deployment in late July of 2019. This work, Brig. 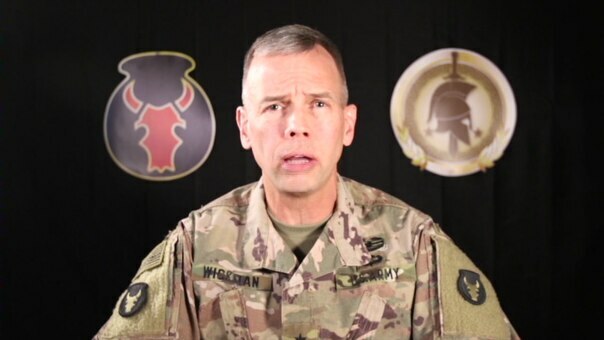 Gen. Mike Wickman speaks with Al Hurra, by SFC Ben Houtkooper, identified by DVIDS, must comply with the restrictions shown on https://www.dvidshub.net/about/copyright.